A member of Iraq's elite counter-terrorism service flashes the "V" for victory sign Tuesday in Ramadi, the capital of Iraq's Anbar province. Iraq's prime minister says the extremist group will be pushed out of Iraq in 2016. Iraqi soldiers walk inside a government complex recaptured from ISIS fighters in central Ramadi, Iraq, Monday. Months after Ramadi was seized by ISIS fighters, Iraqi Prime Minister Haider Abadi traveled to the city that&apos;s now largely in government control and announced that Iraq&apos;s troops will liberate more cities and push ISIS out entirely in 2016. "ISIS was defeated and hundreds of its criminal terrorists were killed" in Ramadi, the prime minister said, according to Iraqi News. He added that "2016 will be the year of the final victory and the end of ISIS presence in Iraq." Ramadi&apos;s return to government control would continue a string of recent military successes against ISIS, but the group still holds Iraq&apos;s second-largest city, Mosul, along with Fallujah. 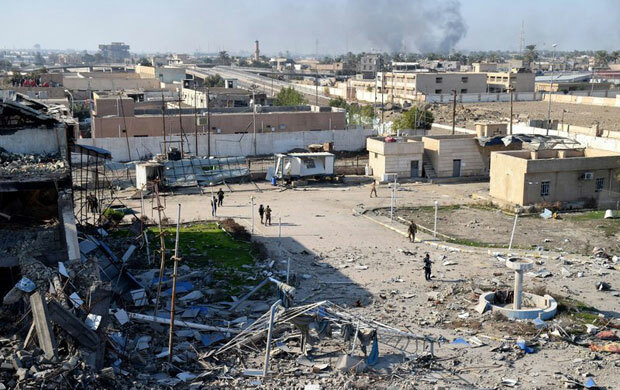 Retaking Ramadi, a city 60 miles west of Baghdad, would have both strategic and symbolic importance. When it fell without a major battle, U.S. officials questioned the Iraqi army&apos;s will to fight. Members of Iraq&apos;s military argued over who was at fault, with one soldier telling NPR in June that the government force was ordered to withdraw from the city with just 30 minutes&apos; notice. On Monday in Ramadi, Iraqi troops reportedly captured an ISIS flag and raised their own banner over a government building. They&apos;re also dealing with booby-trapped buildings and streets, along with fighting on the outside of the city&apos;s center. Ramadi is the capital of Anbar province. Many of its majority-Sunni residents fled the ISIS occupation and the fighting. "In the main area of ISIS&apos;s control this year — which is to say the parts of Iraq and Syria that they call their caliphate — they have lost some towns and some smaller cities, mainly on the edges of their territory. "Earlier in the year, we saw the fight to push them out of the Syrian town of Kobani, where Syrian Kurdish fighters worked with the U.S.-led coalition in a huge battle that left many ISIS fighters dead, although it did largely destroy the town. Those Kurdish forces are still pushing into ISIS turf, with U.S. support. "Then over the border in Iraq, in addition to Ramadi — which we have to remember ISIS only took in May this year — the extremists have been pushed out of several cities — Tikrit, Sinjar, Bayji — sometimes by security forces, sometimes by an array of ethnic or religious militias." The U.S. and its allies have also used airstrikes to attack ISIS and have targeted the group&apos;s finances, which rely on oil sales and other measures. In the face of that, Alice notes, ISIS is trying to emphasize its control — and to tap into grievances in Yemen and elsewhere to help it establish franchise groups. And of course, ISIS has also claimed responsibility for high-profile terrorist attacks far beyond Iraq in recent months, from the downing of a Russian airliner in Egypt to the attacks in Paris. Describing the fight to push ISIS out of Iraq, Alice notes that Iraq&apos;s security forces are trying to seize momentum and take the fight to ISIS strongholds in Fallujah and Mosul. "There are other military sources that say this might be a bit unrealistic," Alice says, "based on the fact that Fallujah and Mosul are heavily populated," unlike Ramadi and other ISIS-controlled cities that have been retaken. "Analysts have also for a long time said that the problem of ISIS in Iraq and Syria won&apos;t be resolved until there&apos;s strong central governments in those places who can offer the people living under ISIS a better life than what they currently have. And right now that&apos;s still, on balance, not really the case."